My poor hubby has been neglected lately. He gets up and heads to work in the morning without breakfast most of the time. I was looking through my cookbooks for something hearty, quick, and easy that I can make him for breakfast. This not only looked easy enough, the sound so good! These would make a fabulous addition to a brunch buffet. You could serve them with some scrambled eggs for a complete breakfast. They could even be turned into an appetizer. Find lengthwise seam in dough. Beginning at seam, gently unroll dough into a rectangle on a lightly floured surface. Roll dough into a 13 x 8-inch rectangle; brush with butter, leaving a 1/2-inch border. Combine sage, salt, and sausage. Sprinkle sausage mixture evenly over dough, leaving a 1/2-inch border; top with cheese. Starting with a long side, roll dough up, jelly-roll fashion; press seam to seal (do not seal ends of roll). Cut 1 (1/2-inch-thick) crosswise slice from each end; discard. Slice roll crosswise into 12 (1/2-inch-thick) pieces; arrange in a 13 x 9-inch baking dish coated with cooking spray. Bake at 350° for 28 minutes or until golden. I make a variation of this. 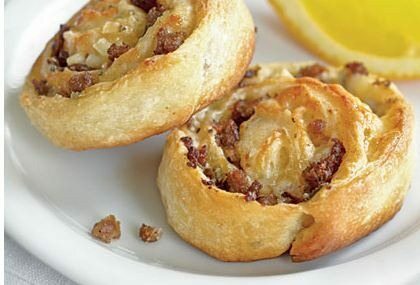 I use cresent rolls (instead of french bread), softened cream cheese (instead of swiss), crumbled bacon (instead of sausage), and minced onion (instead of sage). They are a delicious, easy to make appetizer and are easy to grab and go.